Junction 3 of the M90 is a fairly normal roundabout junction, but to the south-east two sliproads cut the corner between the motorway and the A92. This creates a small wedge of land sandwiched between motorways, and this particular bit of land hold a wannabe service area with so much history that it now has a namesake drama series. Who'd have though it? The fact that this junction is home to the point where lots of traffic heads off towards East Fife made it the perfect site for a service station, after all it would save building individual service stations on the M90 and A92. So, in 1998 the plans were put through for Kingdom services (Kingdom referring to the Kingdom of Fife), sitting in that very slice of land with traffic heading around it in all directions. 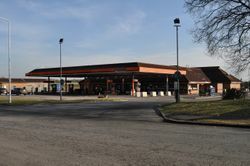 The services consisted of a single building with the petrol forecourt on one side and service station on the other, very similar to the likes of Derby and Burton and Leicester today. This isn't the first time a service station has been built in the middle of a junction either, as the nearby Stirling services demonstrates. It was built by BP and offered a Spar shop, alongside a Wimpy and self-service restaurant. So far it looks like the services were a guaranteed recipe for success, but hang on, because as with all good tragedies this one has a sad bit. Don't be taken in by the bright lights and green windows, as there were quite a few problems with this service area. The first is that it wasn't all that far from Kinross, and as Granada got there first it was decided that Kingdom shouldn't be signed from the motorway. This decision created a bit of fuss and made it to the national press, but that wasn't good enough to make the government change their mind. It was agreed that the services could be signed from the A92 and Kingdom had another trick up its sleeve: the services backed on to the A92-M90 link road anyway, so all they had to do was stick up a couple of BP signs and they had their own advertisement. Well, not quite. At the eastern part of the triangle - where the entrance to the services is - traffic cannot head to or from the M90 south, as until the services were built there was absolutely no need for that movement. This meant that once traffic had seen the BP sign it was too late for them to get there, unless they fancied a 15-mile detour without any signs to guide them. Kingdom could be accessed from the M90, but only via the north-western corner of the triangle, and as there were no signs for the services from here only those who were 'in the know' could get there. However, most people who were 'in the know' would probably know somewhere to take a break which didn't require navigating two large roundabouts before you could get there. So, by the early millennium, all of this had taken such a strain on Kingdom that it was consigned to the history books and closed. For a short while the services opened again, but in the form of Peggy Sue's American Diner. The advantage here is that whoever planned it knew about the motorway problems and aimed the Diner at local residents and passers-by. It wasn't that much of a success though, as by 2004 it had gone. In 2006, Shell decided that it must be third time lucky, and that they could do a better job. In fact, they re-opened the petrol station - still called Kingdom services - and even replaced the sign backing on to the sliproad with their very own. The new filling station also had a Nisa Shop, and Shell too had hopes for this service station, hopes which weren't all marketed at drivers. You see, the half of the building which acted as the service station was this time opened as the Kingdom of Fun, a children's activity centre. The new Kingdom has been separated from the filling station, creating two distinctively different facilities under one roof. 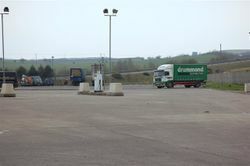 The services also included a lorry park at the back, which has existed at the site since BP, but was forgotten about with the demise of Kingdom services. An industrial estate also exists on the same corner of land. The Shell station didn't last so long, closing in 2008. However, all was not lost for the petrol station - it opened as an independent "Kingdom Services" branded site, still with the soft play area attached. This soldiered on for another 5(?) years, until finally in 2013(?) it closed and the whole area was demolished, with no hope for a future petrol station here. A wild ride indeed! A Google Street View car pictured the site in 2009 (twice) and 2014 on the site and in 2008, 2009 (twice), 2012 and 2014 from the road, showing the stages of change in those years. Interestingly, signs for "Services" were placed on the A92 directed at Kingdom in 2014 - just after the entire site had been flattened! A nearby bus stop is still called 'Kingdom services'. There you have it - over 15 years ago there were high hopes for this building, but disappointment soon settled in and created something totally different. 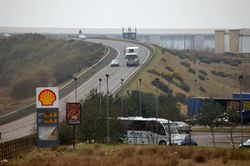 Since then the rules for motorway services have been relaxed and Kingdom could have quite easily gained signs from the motorway, had the opportunity been seized.